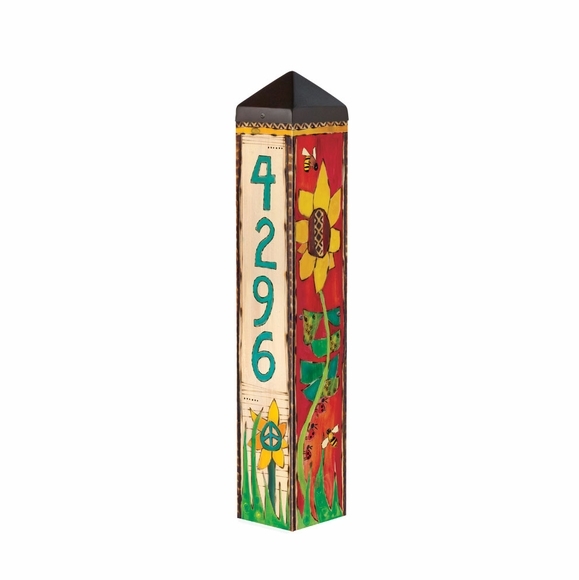 Sunflower Address Pole - - personalized with your house number on a brightly painted art pole. Made in USA. 2' high address pole Welcomes guests with vivid colors and happy sunflowers. House number is painted on the one side that will face the road. Ultra-durable for years of enjoyment. Includes installation hardware. No digging required. Customized with any address number up to four digits. Dimensions: 5" x 5" x 24" high. Please all 2 to 3 weeks for delivery. Art Poles bring beautiful artwork to any landscape. Yes, I would purchase one. It is beautiful and has had a professional finishing job. I love it. What I don\'t like is that the part going into the ground is really poor quality. A storm knocked the entire item over. I have it for a very short time and have needed to push in the ground poles twice already to stop it from falling.